1 Towel warmer – Hypothermia, or chilling of the body, can cause many complications during and after surgery and anesthesia. Constant replacement of warmed blankets help anesthetized patients maintain body temperature before, during, and after surgery. The warmed blankets also help retain the head generated by the warm water circulation pad that is placed under every patient. 2 Surgical laser –It may be difficult to imagine any surgery done without a cutting instrument like a scalpel or knife, but that is just another of the ways surgery at Country Care Pet Hospital differs from most others. All of our surgeries are performed with a surgical laser, rather than using a surgical blade. This amazing technique limits post-operative pain, prevents intra-operative surgical bleeding, and speeds healing time. 3 Oxygen line and scavenger tubing –In most rooms at Country Care Pet Hospital, anyone who looks up will note a short, dark green tube extending from a small mount in the ceiling. These are oxygen delivery systems. Each is connected to large oxygen tanks which are out of site and mounted in a safe location elsewhere in the building. The presence of oxygen in every room gives us the opportunity to administer life-saving oxygen therapy anywhere it is needed. 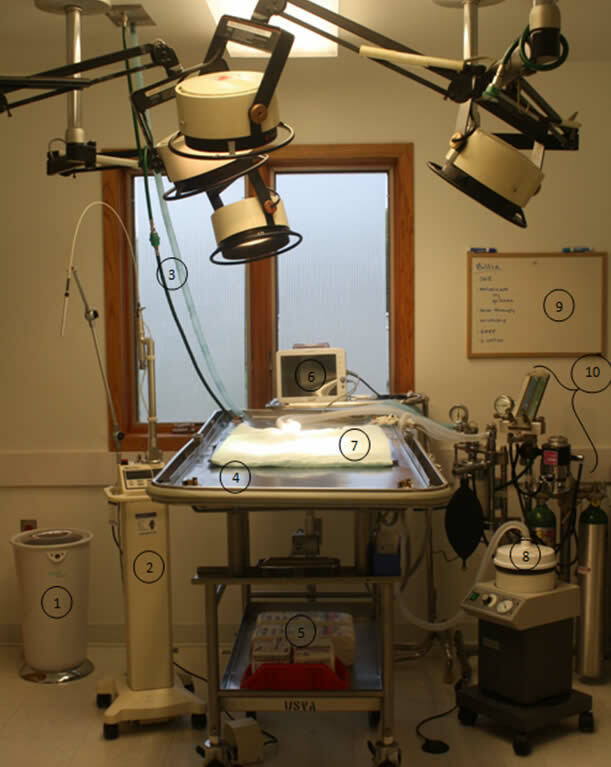 You may note there are two of these systems in the surgical suite to enable the use of more than one anesthetic delivery system or to facilitate re-arranging surgical equipment for certain procedures. The corrugated blue tubing collects and draws away any excess or waste anesthetic gas that results from the exhalation of the patient. This protects the patient and any people present in the room from unnecessary exposure to the anesthetic drug. 4 Surgical table –Our surgical table is used for only one purpose: surgery. This may seem intuitively obvious, but this is actually not always the case in some veterinary clinics. Having a stainless steel tabled dedicated to only sterile procedures helps ensure potential contaminants are kept at an absolute minimum. 5 Emergency supplies In our effort to be prepared for any unexpected complication of surgery or anesthesia, we maintain a ready supply of emergency medications, resuscitation equipment, and sterile packs of suture material. Though complications are rare, we strongly believe in being prepared! 6 Surgical monitor – There is no piece of electrical equipment that can ever truly take the place of a trained veterinary anesthesia assistant or technician! However, this piece of equipment helps its human counterpart by providing a continual, second by second report of the patient’s blood oxygen concentration, pulse rate, temperature, and blood pressure. It also provides, and can print, a steady tracing of the patient’s ECG, or electrocardiogram. The combination of all these pieces of information allow monitoring of the patient’s well-being during anesthesia and helps with early identification of any problems that might develop. 7 Circulating water warming pad – As we mentioned earlier, maintaining the patient’s body temperature neither too warm nor too cool is critical for a successful outcome of surgery and anesthesia. The soft, pillow-like pad is attached to a warming device that pumps water of an exact temperature, depending on the chosen setting. Unlike inexpensive electric heating pads, which often malfunction causing burns and electric shocks, the circulating water pad cannot overheat or shock the patient. 8 Laser plume evacuator – A by-product of the use of the surgical laser is the air-borne moisture and particulate matter that is generated when the laser opens tissue via its focal dehydrating technique. This vacuum-like device removes the moisture and particles from the surgical site and surrounding air. 9 Dry erase board – Even when we do our memory exercises, people forget things! To avoid this problem, Country Care Pet Hospital has many Fail-Safe procedures, including this totally low-tech dry erase board. On it is a check-list which is updated for each and every patient who has a procedure in our surgery suite. The check-list is compared to the patient’s written chart notes and to the notes in our veterinary hospital specific computer program. 10 Anesthesia machine – Considered an absolute necessity by current standards of care, this is the machine which regulates the mixture of oxygen and inhalant anesthetic that is delivered to the patient. The part of the machine called the vaporizer contains a sophisticated temperature sensor that corrects the concentration of gas that is allowed to flow to the patient based on the ambient temperature of the room. The part of the machine called the canister removes moisture from the patient’s exhaled breaths and recycles a portion of the gasses. Would you like to view our Surgical Suite for yourself? Please give us a call and we’ll be happy to arrange a tour!